Betty Herman, Canadian artist born in Montreal in 1960, moved to Toronto to study psychology at the University of Toronto. Her psychology studies refueled her interest in art as a means of bringing unconscious thoughts and emotions to consciousness. Herman went on to study drawing, painting, printmaking, textile design and art history at the Ontario College of Art and Design, graduating with honours in 1993. Since graduation, her art practice has included research in the field of humanities combined with art production and exhibitions, educational outreach and teaching. In 2007, Herman curated and was an artist participant in "In Search of the Commonplace". Visual artists from The Once Around the Sun Collective and spiritual musical performers from The Healing Divas joined together in creative working sessions that stimulated exchanges of artistic process and development. The yearlong collaboration culminated in an exhibition at The Etobicoke Civic Centre Art Gallery, combining visual art, musical performance and video documentation. Most recently, Herman’s creative practice has extended to theatre set painting for The Curtain Club community theatre. Herman is currently working on a series of mixed media drawings and paintings incorporating historical pattern designs, printmaking techniques and woodworking. Herman lives in Toronto with her husband and dog. 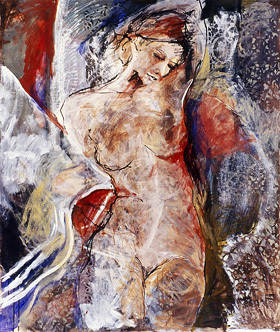 Her work can be found in many private and corporate collections throughout Canada and the U.S.